Pete Meyers spotted and posted on Twitter another flavor of the featured snippets, this one includes a query expansion feature asking the searcher if they also want to try to search for another flavor of the query. Notice the part "Search for: How big is my baby at 29 weeks?" If you click on that, it takes you to a search result set for that and the featured snippet does slightly change to add a graphic, in my case. Google is always messing around with their search results user interface, but this is an interesting one. 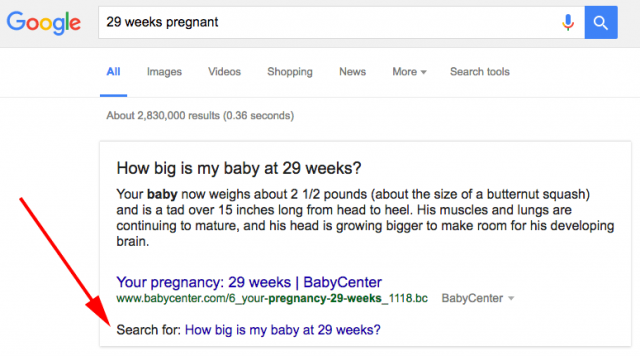 Showing a featured snippet for a query Google suggests you try based on your original query.